I have not seen such a biased headline in a long time as I have seen today with the front page alarm “Poor to be hit the hardest”. It headlines with a political opinion and then has the nerve to mention early in the article that “state officials are still examining the details”. 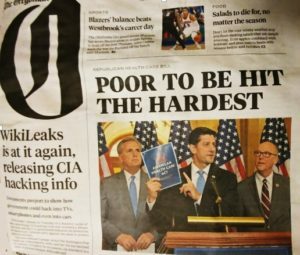 This is also a disservice to Oregon’s Greg Walden who is there on the Oregonian front cover trying to fix a serious failure in our health care system. Please, please, please wake up journalists. Obamacare is failing and the reason that most Americans disapprove of it is because they are actually being negatively impacted by its failing. This biased opinion-based headline belongs in the Editorial section and not on the front page of a newspaper. P.S. If you want to read in Greg Walden’s own words what he has proposed, you can read his Wall Street Journal guest opinion article here.